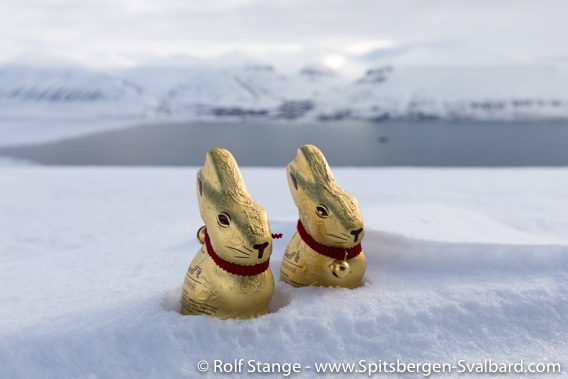 After an early snow melting period last week, the winter returned to Spitsbergen exactly on Easter Sunday with temperatures below zero. After a couple of very wet and grey days, which frustrated tourists, locals, guides and tour operators alike, molten snow became ice – at least! – and the sun came out again. 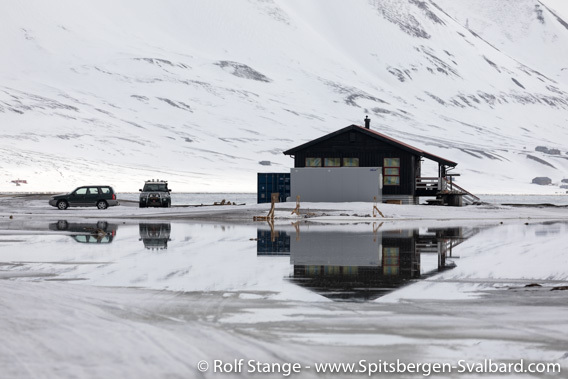 Longyearbyen Camping: last week a lake, this week an ice area. Longyearbyen Camping, last week an impressive landscape of lakes and lagoons, is now an ice area, with a surface just a bit too rough to provide a useful skating rink. Elsewhere, it is flat and shining as a mirror, something that does not make moving around easier, both in the field and in town. Spikes (isbrodder in Norwegian) can be very helpful and may prevent accidents. Adventdalen: last week a river, this week a skating rink. Now it is good to be outside again! Yes, this is how the last entry started as well. It is not great. 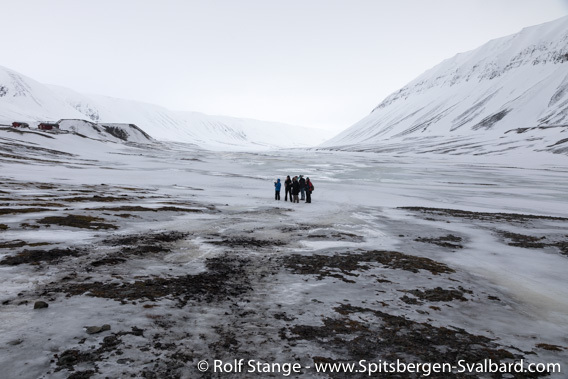 Yes, there have always been mild air incursions with thawing temperatures and rain in Spitsbergen, even in mid-winter. The climate here is maritime. But a whole week? In April, a month that tends to be quite stable otherwise? That is quite tough. This is what the weather forecast looked like on Wednesday. Temperatures in red, above zero, and rain. This is how it was pretty much all of the week, from Monday to Friday. Today (Saturday), there is some mild frost again, at least. The riverbed of Longyearelva had to be opened to prevent flooding of the road. Wherever you look, it is sad. It is melting and flowing everywhere. There are ponds and lakes instead of white snow surfaces, smaller rivers have started to flow again, tundra areas are coming through the wet snow. here in Bjørndalen in the beginning of this snow melt week. 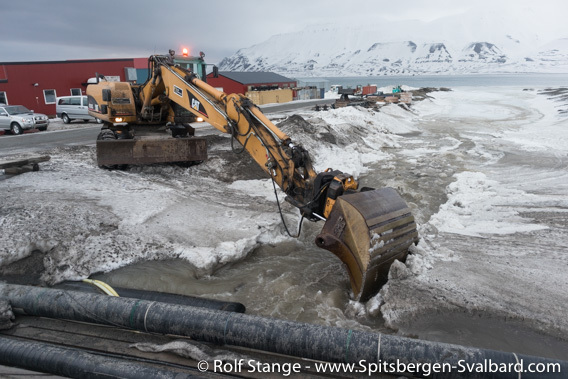 They had to come with a digging machine to clear the river bed of Longyearelva, the river in Longyearbyen, from snow to prevent the road from being flooded. That is a normal procedure – but not in mid April (it was on Thursday). The campsite is a lake. There was actually one lonely camper a week ago, but he left for some reason. The campsite near Longyearbyen is a lake. The Easter weekend has begun, one of the main tourist seasons in Norway. Everybody is out and about, on tour somewhere, on holiday or visiting someone. Preferably something that has to do with a hut, snow and ski, alternatively a boat will also do. 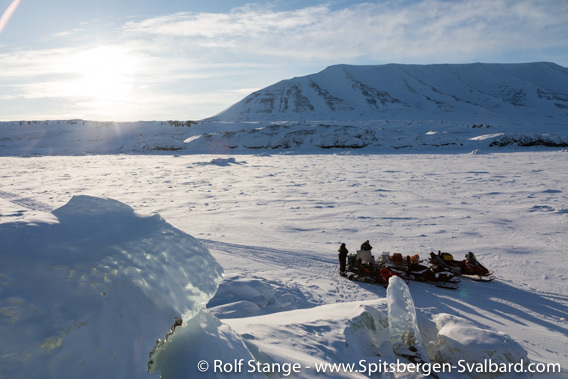 A boat might actually be the better option than the kind of tour that you would expect in Spitsbergen at this time of year. 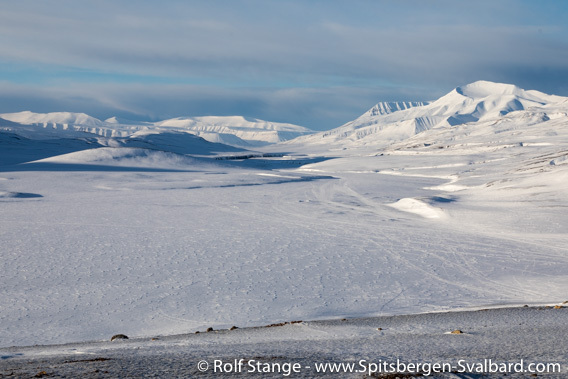 White, wide snow landscapes, snow mobile trips to places far away or dog sledge tours and ski hikes somewhere around Longyearbyen. But, alas, everything is grey and wet and water is flowing everywhere. The hotels are fully booked, planes come every day with easter tourists who have booked rooms and trips for stunning prices, looking forward to a taste of the real Arctic. Right place, but wrong time. Instead, mine 3, which is a museum mine now, is getting a lot of visitors. This is one of few places where you can book an interesting excursion right now regardless of the weather conditions, as long as the road is open. Not the kind of experience most would have thought of when they planned their trip, but certainly a very interesting experience. Just for the sake of completeness: they are still running some snow mobile tours, obviously under rather marginal conditions. 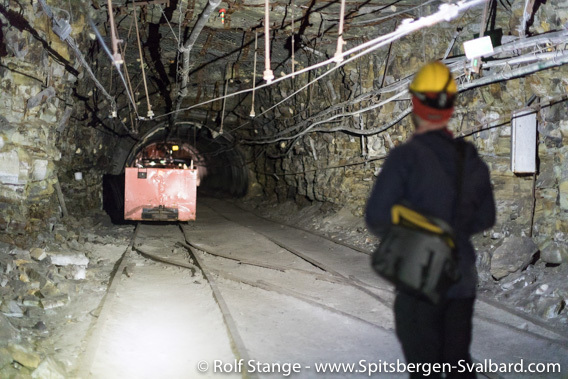 Visiting gruve 3, the visitor mine. Today (Easter Saturday), there is some mild frost again, and temperatures are supposed to fall tomorrow. We will see if we get a bit more winter here again, or if the winter season is already over. That is a question many are considering in Longyearbyen now. 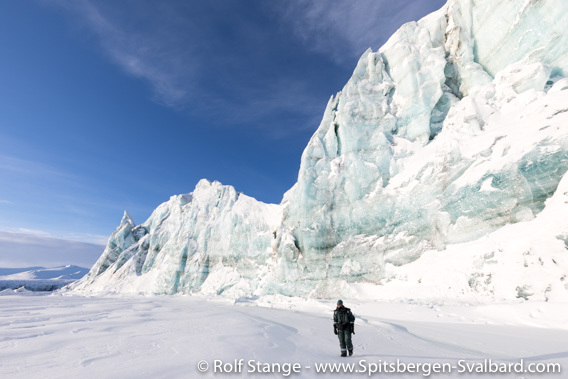 Currently – today it is 18 April – I get the impression that Spitsbergen is really melting and flowing away. The snow melt has started, several weeks to early. This April will without any doubt be the 101st month in a row with temperatures above the long-term average. 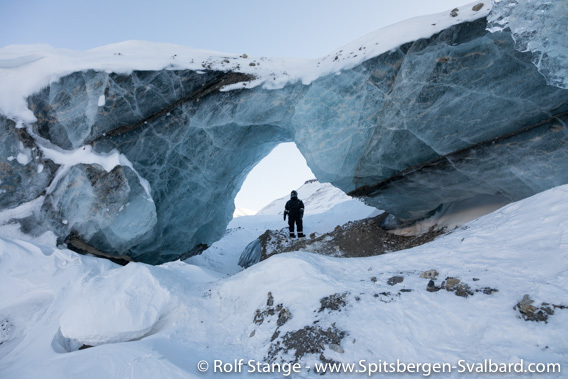 … that we went to the ice cave in Longyearbreen. There are ice caves here in pretty much all glaciers, and the one close to Longyearbyen are popular places to visit, both by tourists with guides and by locals. 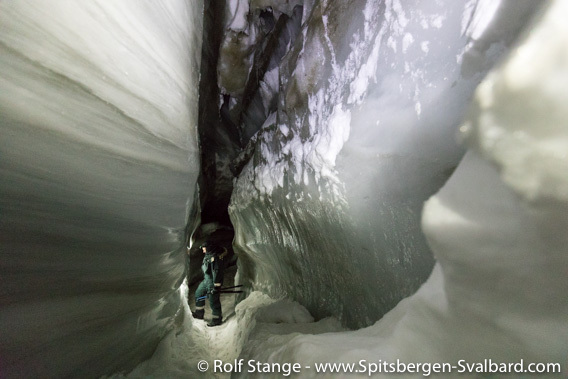 You can dog-sledge or ski to the ice cave in Scott Turnerbreen in Bolterdalen, you can hike to the one on Larsbreen, also with snowshoes or on ski, and you can get to the one on Longyearbreen with a wider range of transportation means, here also including snow mobile or snow cat. 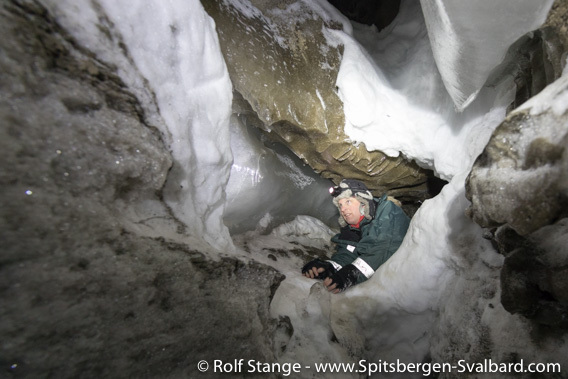 In the ice cave in Longyearbreen (mid March). The ice caves are actually meltwater channels, but they usually fall dry during the winter season (meltwater flow may occur at any time of year, so be careful). Then they can be visited. Depending on the “terrain”, this can be easy or difficult. Some are so narrow and steep that visiting them may be impossible, at least for normal people, others are more visitor-friendly. In any case, an ice cave is a fascinating experience! February and March 2019 have mostly been cold months with temperatures around -20 degrees centigrade and below over many periods, but it has not been enough to reach the monthly average. Also in March, the average temperature of the months was above the long-term average. 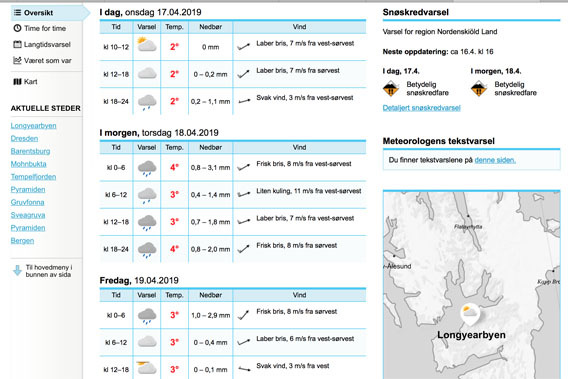 This was the 100th month in a row that the temperature (average of the month) was above the long-term average – more than 8 years, in other words, as climate scientist Kjetil Isaksen reports to Svalbardposten. The reference period for the long-term average is 1960-1990. 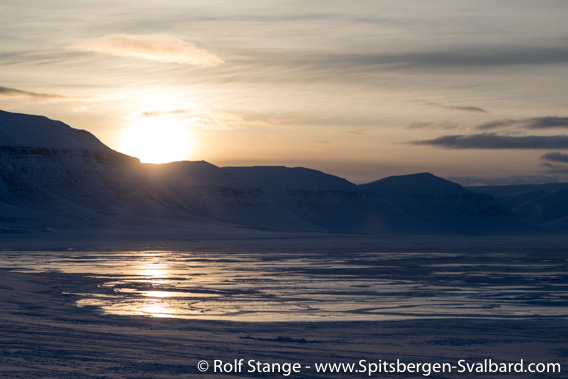 The normal temperature from this period is history: climate change is three times faster in Spitsbergen than in mainland Norway and six times faster than globally. According to Isaksen, this is largely due to increased water temperatures in the fjords and surrounding seas: there is more heat exchange between sea and atmosphere than before and the decreased ice cover enables the water to absorb sun radiation and turn it into heat rather than reflecting a higher proportion back into space as previously. Scientists do not expect this trend to stop at any time soon. 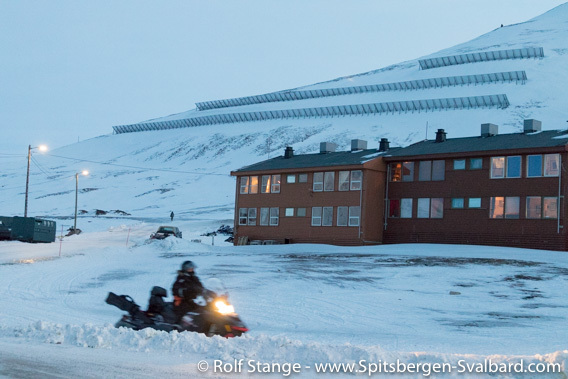 In Longyearbyen, the community is adapting to a new climate. Avalanche barriers on Sukkertoppen close to Longyearbyen. After the catastrophic avalanche from 19 December 2015 which has claimed two lives, hundreds of inhabitants are evacuated every year during the avalanche season, many of them for several months. Plans are currently made to tear down buildings with 142 flats in areas which are at risk from avalanches. 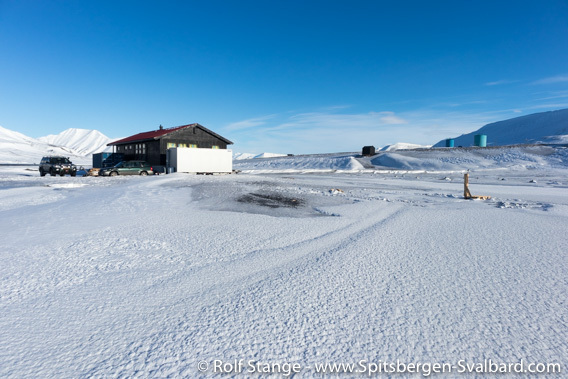 Housing shortage and an overheated housing market are challenges that many locals in Longyearbyen currently have to deal with. Also in Barentsburg people are aware of these developments and an avalanche risk map has recently been published. Some buildings are in areas at risk and would not be built now where they are today. But it is assumed that the situation can be controlled technically, without moving or tearing down buildings. As beautiful as Longyearbyen’s surroundings are especially at this time of year, it is always tempting and actually also great to get further away from “civilisation”. 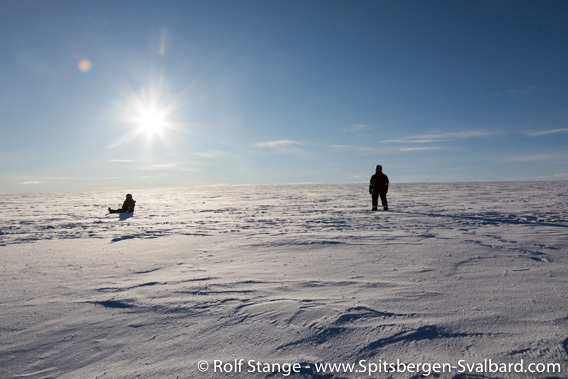 We take the opportunity that the fine weather provides, pack the sledges and set course east through Adventdalen. 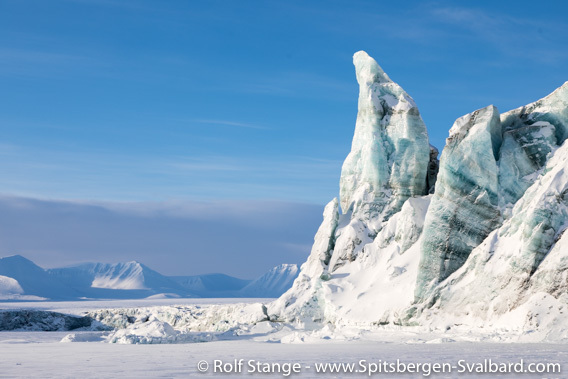 Spitsbergen’s east coast, especially Mohnbukta, is a classical destination for snow mobile tours in the late winter – now – for good reason, as you will see! It is cold, around minus 20 degrees centigrade as so often during the last couple of weeks. Clear and calm. 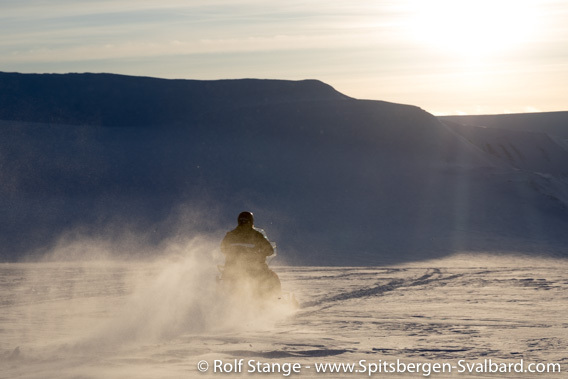 The large moraine of Rabotbreen, east of Sassendalen, may be an obstacle for some who are not used to driving snow mobiles, as there are some curves, bends and little slopes. Dead glacier ice in the moraine of Rabotbreen. For us, it is a great and very impressive bit of landscape. Just the scale is enormous! And then there are some exposed bits of dead glacier ice, slowly melting away, creating some amazing shapes and colours on their way back to the global water cycle. The little ice cap Nordmannsfonna. We have reached Mohnbukta after a short drive down another glacier. The bay and the wide waters of Storfjord are frozen solid as far as we can see, and we have a fantastic view all the way to Barentsøya and Edgeøya. The ice is a fantastic world in itself! There are some small (well, it is all relative), but beautifully (absolutely!) weathered icebergs frozen in the sea ice. We had some stunning specimens here in earlier years, click here for some panorama photos of ’em. Then there is the glacier front of Hayesbreen as the scenic highlight of the day. Just stunning! Especially on a day like this. 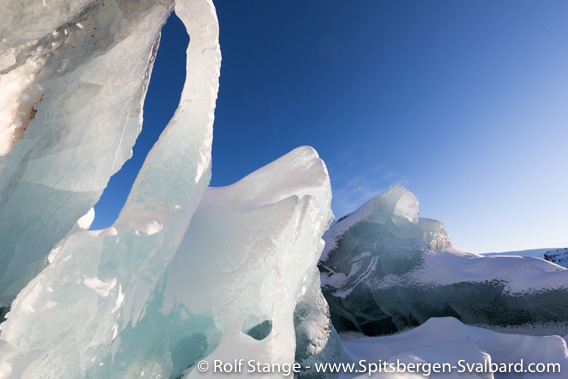 Now – it is late March – the sun is still low even around noon, which is when she is coming from the perfect direction to illuminate this amazing ice cliff. A great spectacle of ice, of colours, shapes and size! Glacier front of Hayesbreen, Mohnbukta (I). Glacier front of Hayesbreen, Mohnbukta (II). Then … off again, and back home. We have still got more than 90 kilometres ahead of us. Way back home over Königsbergbreen. The lovely evening light makes the trip over Königsbergbreen and through Sassendalen another delight. Something we just have to enjoy, there won’t be any evening light here anymore in just a few weeks time! Finally, my current ceterum censeo: I have made a new photo book, focussing on aerial photography and thus showing the Arctic from a very unsual perspective. In theory, the book is in German, but in practice, it does hardly have text. 134 out of 137 pages do just have stunning photos, placenames and a little map. 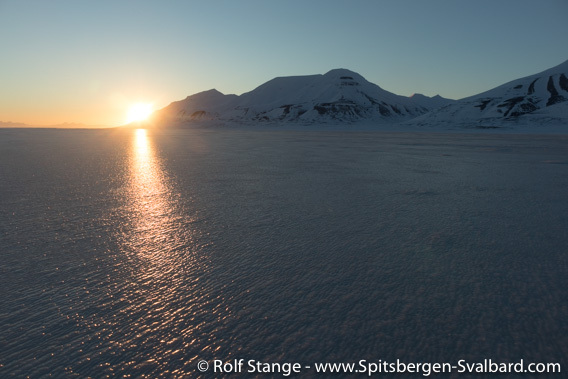 Norwegens arktischer Norden (2) – Aerial Arctic shows Jan Mayen and Svalbard from the air. 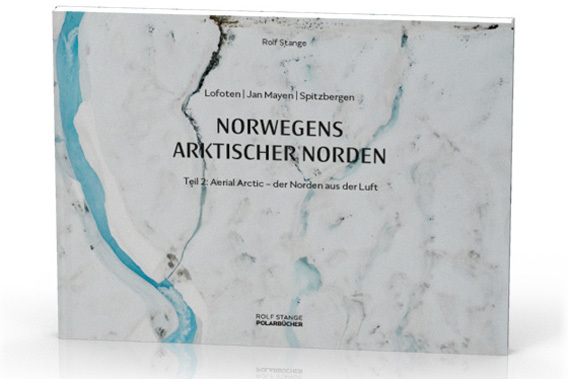 Rolf’s new photo book Norwegens arktischer Norden (2) – Aerial Arctic shows Jan Mayen and Spitsbergen from a new and stunning perspective.